A stained glass window commemorates those from the parish and district who died in service or were killed in action during World War Two. The East Window of the church originally was a memorial to servicemen of the 1914-18 War in St. Clement, Newhall in the diocese of Sheffield, England. The area was bombed during World War Two and later became industrialised. Use of the church declined and it was closed down and demolished in 1963, and the fine five light window was made available to All Saints. The late Lady De L’Lisle, wife of the then Governor-general of the Commonwealth was very interested in the project, and was, with the first Rector [Rev Edward Gilbert (Ted) Buckle 1959-1962, DIB] , to a large extent, responsible for the gift to All Saints’ through the Church Commissioners in England. The window has a crucifixion scene with Saint Peter on the right and Saint Clement on the left with Isaiah, Saint Michael and David forming the base. The whole has been enclosed in a steel frame measuring eleven feet at the base rising to fifteen feet in a gothic arch. The stained glass artist responsible for the re-designing and installation was Mr Phillip Handel of Sydney. The original installation in England came from the studio of Charles Kempe. The window has been dedicated as a War Memorial to servicemen and women of the Parish and district. A war memorial window will be dedicated by the Archdeacon of Canberra, the Venerable F. M. Hill, in All Saints Church, Ainslie, at a special Remembrance Sunday service tomorrow at 9.30am. The High Commissioner for the United Kingdom, Sir Charles Johnston, will unveil the commemorative plaque, and the Member for the ACT, Mr J. R. Fraser, will read a lesson. The window, which was a gift from the Diocese of Sheffield, England, was originally a war memorial in the Church of Saint Clement, Newhall. It was designed and fashioned in its present form by Mr Philip Handel, a stained glass artist of Sydney, and will be dedicated in memory of those of the district who fell in the Second World War. The Canberra Times (ACT), 11th November 1967. 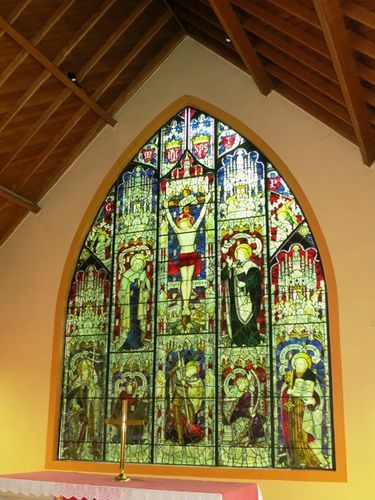 Save the Window fund was launched last Sunday to pay for repairs and maintenance to the stained-glass window at All Saints' Anglican Church, Ainslie. The window was installed in the church in 1968 (sic) as a memorial to people from the Ainslie who died as a result of World War II. During the past three years a bend of about six centimetres has occurred in the window, caused by heat and earth tremors. Repairs were done to the window last week and it is expected this will cost about $1,800. The window originally came from St Clement's, in Sheffield, UK, where it served as a memorial for about 50 years to people from that area who were killed in World War I. The Canberra Times (ACT), 18th January 1978. By The Venerable F. M. Hill, Th. L.
The Reverend N. J. Chynoweth, M.A., Th. L. Rector. C. J. Wadie, H. S. Clarke, W.. L. Perry, Wardens.